Transfer of pollen grains to the stigma of a pistil is called pollination. Depending on the source of pollen, there are three types of pollination, viz, autogamy, geitonogamy and xenogamy. Autogamy: When pollen grains from the anther are transferred to the stigma of the same flower, pollination is called autogamy. Chasmogamous Flower: When a flower exposes its anthers and stigma, the flower is open to pollination from any other flower. This condition is called chasmogamy and such a flower is called chasmogamous flower. Complete autogamy is rare in chasmogamous flower. Perfect synchronization between pollen release and stigma receptivity is required in such flowers to allow self-pollination. Cleistogamous Flower: When a flower does not open at all and thus does not expose its anthers and stigma, it is called cleistogamous flower. Self-pollination or autogamy is guaranteed in such condition. Examples: peanut, pea, beans, viola, etc. Cleistogamy ensures seed set even in the absence of pollinators. But cliestogamy is not advantageous as it promotes in-breeding depression in the population. Geitonogamy: When pollen grains are transferred to another flower of the same plant, the pollination is called geitonogamy. Geitonogamy is functionally cross-pollination but genetically similar to autogamy because pollen grains come from the same plant. Xenogamy: When pollen grains are transferred to stigma of a different plant, the pollination is called xenogamy. In this case, pollination brings genetically different types of pollen grains to the stigma. Plants use two abiotic (wind and water) and one biotic (animals) agents to achieve pollination. Majority of plants use biotic agents for pollination. Only a small proportion of plants use abiotic agents. Pollination by Wind: Pollination by wind is more common amongst abiotic pollinations. Wind-pollinated plants produce pollen grains which are light and non-sticky. Stamens are usually well exposed so that pollens can be easily dispersed into wind currents. Stigma is large and feathery so that it can trap air-borne pollen grains. Wind-pollinated flowers generally have a single ovule in each ovary. Numerous flowers are packed into an inflorescence, e.g. corn cob. Pollination by wind is quite common in grasses. Pollination by Water: Pollination by water is quite rare in flowering plants and is limited to about 30 genera, mostly monocotyledons. Some examples of water pollinated plants are Vallisneria and Hydrilla which grow in fresh water and several marine sea-grasses such as Zostera. In Vallisneria, the female flower reaches the surface of water by the long stalk and the male flowers or pollen grains are released on to the surface of water. They are carried passively by water currents; so that they can reach the stigma. In another group of water pollinated plants such as sea-grasses, female flowers remain submerged in water and the pollen grains are released inside water. Pollen grains in many such species are long, ribbon like and they are carried passively inside the water; some of them reach the stigma and achieve pollination. In most of the water-pollinated species, a mucilaginous covering protects the pollen grains becoming wet. Pollination by Animals: Majority of flowering plants use a range of animals as pollinating agents. Bees, butterflies, flies, beetles, wasps, ants, moths, birds (sunbirds and humming birds) and bats are the common pollinating agents. Among the animals, insects, particularly bees are the dominant biotic pollinating agents. Often flowers of animal-pollinated plants are specifically adapted for a particular species of animal. Majority of insect-pollinated flowers are large, colourful, fragrant and rich in nectar. When the flowers are small, a number of flowers are clustered into an inflorescence to make them conspicuous. Animals are attracted to flowers by colour and/or fragrance. The flowers pollinated by flies and beetles secrete foul odours to attract these animals. To sustain animal visits, the flowers have to provide rewards to the animals. Nectar and pollen grains are the usual floral rewards. For harvesting the reward(s) from the flower the animal visitor comes in contact with the anthers and the stigma. The body of the animal gets a coating of pollen grains. Pollen grains in animal-pollinated flowers are generally sticky. When the animal carrying pollen on its body comes in contact with the stigma, it brings about pollination. In some species floral rewards are in providing safe places to lay eggs. The tallest flower of Amorphophallus (the flower itself is about 6 feet in height) shows a good example of this phenomenon. A similar relationship exists between a species of moth and the plant Yucca where both species – moth and the plant – cannot complete their life cycles without each other. The moth deposits its eggs in the locule of the ovary and the flower, in turn, gets pollinated by the moth. The larvae of the moth come out of the eggs as the seeds start developing. Outbreeding Devices: Majority of flowering plants produce hermaphrodite flowers and pollen grains are likely to come in contact with the stigma of the same flower. Continued self-pollination results in inbreeding depression. Flowering plants have developed many devices to discourage self-pollination and to encourage cross-pollination. The third device to prevent inbreeding is self-incompatibility. This is a genetic mechanism and prevents self-pollen (from the same flower or other flowers of the same plant) from fertilising the ovules by inhibiting pollen germination or pollen tube growth in the pistil. Another device to prevent self-pollination is the production of unisexual flowers. If both male and female flowers are present on the same plant such as castor and maize (monoecious), it prevents autogamy but not geitonogamy. In several species such as papaya, male and female flowers are present on different plants, i.e. each plant is either male or female (dioecy). This condition prevents both autogamy and geitonogamy. Pollination does not guarantee the transfer of the right type of pollen (compatible pollen of the same species as the stigma). Often, pollen of the wrong type, either from other species or from the same plant (if it is self-incompatible), also land on the stigma. The pistil has the ability to recognise the pollen, whether it is of the right type (compatible) or of the wrong type (incompatible). If it is of the right type, the pistil accepts the pollen and promotes post-pollination events that lead to fertilisation. If the pollen is of the wrong type, the pistil rejects the pollen by preventing pollen germination on the stigma or the pollen tube growth in the style. The ability of the pistil to recognise the pollen followed by its acceptance or rejection is the result of a continuous dialogue between pollen grain and the pistil. This dialogue is mediated by chemical components of the pollen interacting with those of the pistil. After pollination, the pollen grain germinates on the stigma to produce a pollen tube through one of the germ pores. The contents of the pollen grain move into the pollen tube. Pollen tube grows through the tissues of the stigma and style and reaches the ovary. You would recall that in some plants, pollen grains are shed at two-celled condition (a vegetative cell and a generate cell). In such plants, the generative cell divides and forms the two male gametes during the growth of pollen tube in the stigma. 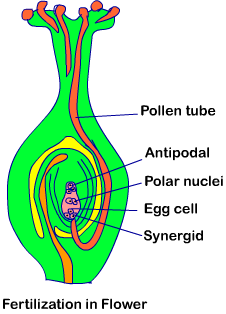 After reaching the ovary, the pollen tube enters the ovule through the micropyle and then enters one of the synergids through the filiform apparatus. Many recent studies have shown that filiform apparatus present at the micropylar part of the synergids guides the entry of pollen tube. All these events–from pollen deposition on the stigma until pollen tubes enter the ovule–are together referred to as pollen-pistil interaction. Artificial Hybridisation: Artificial hybridisation is one of the major approaches of crop improvement programme. In such crossing experiments it is important to make sure that only the desired pollen grains are used for pollination and the stigma is protected from contamination (from unwanted pollen). This is achieved by emasculation and bagging techniques. Emasculation: If the female parent bears bisexual flowers, removal of anthers from the flower bud before the anther dehisces using a pair of forceps is necessary. This step is referred to as emasculation. Bagging: Emasculated flowers have to be covered with a bag of suitable size, generally made up of butter paper, to prevent contamination of its stigma with unwanted pollen. This process is called bagging. When the stigma of bagged flower attains receptivity, mature pollen grains collected from anthers of the male parent are dusted on the stigma, and the flowers are rebagged, and the fruits allowed to develop.